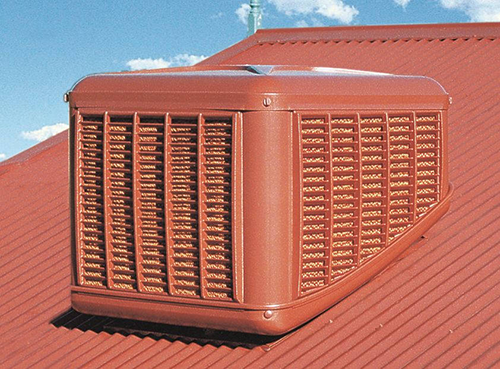 Evaporative air conditioning Adelaide - Joe Cools Adelaide supply and install low cost, eco-friendly evaporative air conditioning in the Adelaide metropolitan area. Ducted evaporative air conditioning provides cooling to multiple rooms via a network of ducts installed in the roof, which distributes air through air ducts and vents that are visually and purposefully positioned, or through a plenum. How do evaporative air conditioners work? An evaporative air conditioner only cools. The technology is completely different to refrigerated air conditioning. It is a natural method of cooling that uses air and water. Warm air is drawn by a fan from outside into the cooling unit and passes over a series of wet filter pads. As it passes over the pads some of the water evaporates absorbing the heat, as it does so it cools and humidifies the air which is then blown into the house, and forces the warm air through the open windows and doors. This air conditioning system uses the same principle to the cooling system of your own body. Your body perspires creating sweat on the skin, as the sweat evaporates, the body receives a cooling effect. Ideal for open areas, undercover patios and workshops. May be installed as a ducted system. Works best in climates with low humidity, as in Adelaide and surrounds. Installation usually complete in one day. Evaporative cooling does not require an enclosed space to work. An evaporative cooler can only effectively operate when the household windows and doors are open to expel air. This may be a security risk. The large evaporative unit is mounted on the roof and may present as an unsightly feature. During the colder months when not in use, some roof located units should have covers placed over them and ceiling vents closed to prevent heat loss. Many new units have an automatic spring or gravitational shutter to prevent any heat loss. They may require more maintenance than a reverse cycle air conditioner. Economical to run for electricity consumption. These units will increase your water consumption. They tend to be less popular than reverse cycle air conditioners, and only have a very small share of the market. Filters and cleans the air. Eco-friendly as it does not require refrigerant. An evaporative cooler requires doors or windows open to allow airflow, this can be a problem for people sensitive to dust and pollens. The higher humidity is outside, the less effective the evaporative air conditioner will work so their performance drops in humid conditions because the air is saturated with water vapour and this reduces the amount of evaporation and cooling possible. Humidity of the air inside will increase further if the air-flow is restricted by closing off doors or windows. If you have any questions just give us a call on: 1800 JOECOOLS or send us an email; we're happy to chat. Copyright Joe Cools © 2017-18. All rights reserved.